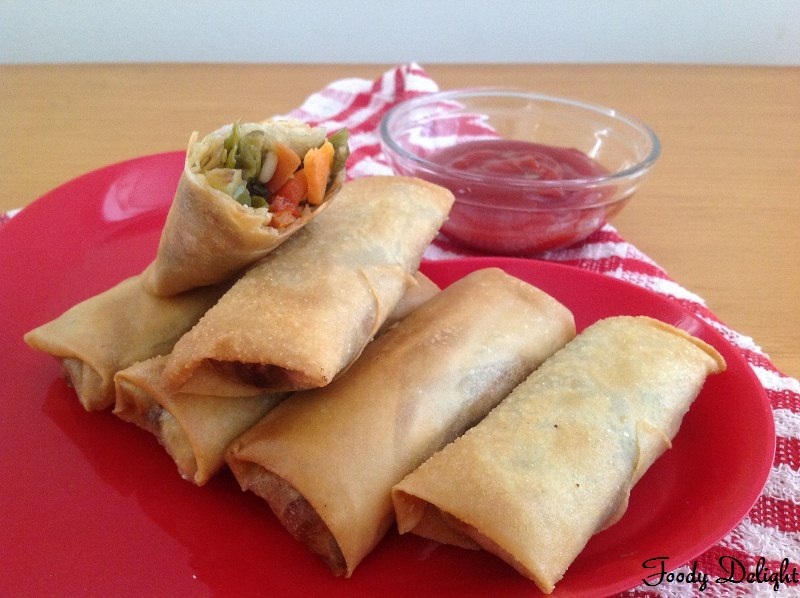 Spring rolls are the favourite appetizer for many people. In Thai language these spring rolls are known as "Poh Pia Tod".These are made with the thin outer wrapping filled with rice noodles and colourful veggies and some times meat is also added and then deep fried to a golden brown in colour.These Thai style spring rolls are light and refreshing appetizers with an exotic flavour. Defrost the pastry sheets and wrap them in the wet towel for atleat 15 minutes ,so that the pastry sheet can be easily bent. Cut all the veggies.Keep it aside. Boil the thin rice noodles into hot boiling water for about 10 minutes. Strain it using kitchen mesher and keep it aside. Place the pan on high flame and add sesame oil into it. When oil heats ,add sauce mixture and stir well. Add cooked noodles and mix well . Turn off the flame and let the mixture cool down a little. Make the paste of all purpose flour and water to stick the edges of the spring rolls. 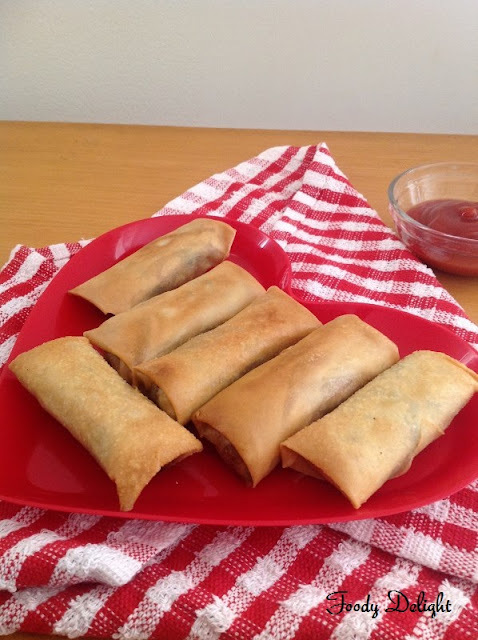 Place about 2 tbsp of veggie mixture at one edge of the spring roll pastry and roll over once, tuck in the sides and then continue rolling . Then seal the last edge with the paste. Repeat the same with the remaining spring roll pastry. Fry the spring rolls into oil till they light golden in colour. 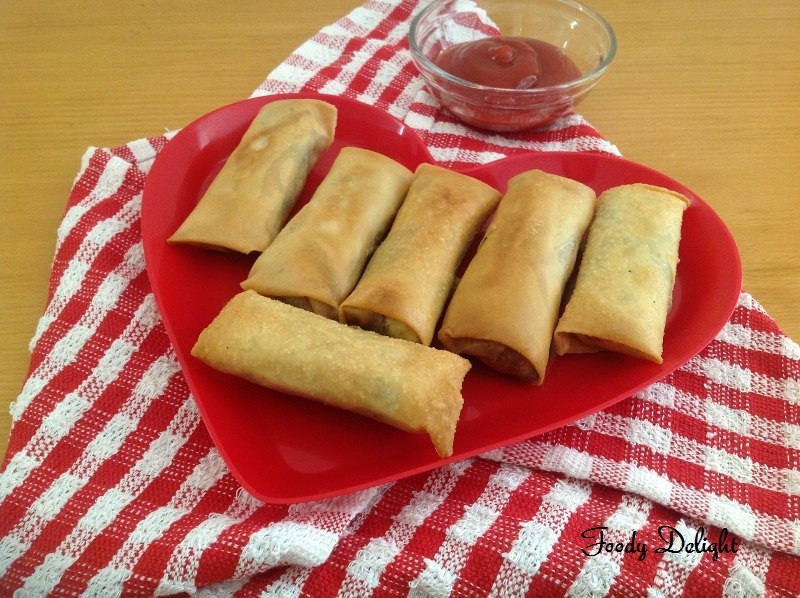 Crispy and yummy spring rolls! Yummm, my favourite spring rolls,feel like having some..